Copthorne Prep, represented by Amelie Rees, Niamh Grace and Natalie van Hoven, entered the Southern semi-final of the ECF National Schools Girls’ Tournament held at St Catherine’s, Bramley on Sunday 13th January. Amelie and Natalie are both only Under-9, and Niamh is Under-8. 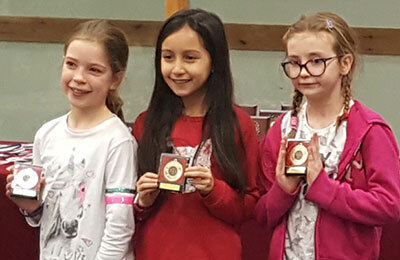 56 teams entered the Under-11 section and Copthorne were placed 6th overall with 10½ points out of 15, winning the Top Under-9 team gold medal, and qualifying for the Final.